why do we only rest in peace, why don't we live in it too? 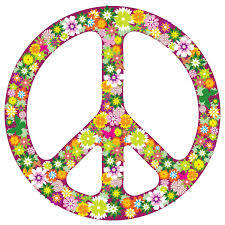 Surprisingly peace means either a state or period in which there is no war or freedom from disturbance, tranquillity. (Oxford Dictionary) I find it contradictory that we make war so that we may live in peace. Aristotle. On this day in 1949 NATO was established after WWll; in 1958 10,000 protesters congregated as part of the Campaign for Nuclear Disarmament (the origin of the peace symbol above); and in 1968 Martin Luther King was murdered. Yet the state of world peace has not improved. In 1984, Dr Robert Muller, Secretary General of the UN met my teacher Don Conreaux on a Gandhi cross-country peace march. Since then he and now I have been inspired by his words.... “The day of world peace will come when people will gather in circles all over the world, join hands, give thanks for life and breath, and listen to all the gongs and bells ringing around the globe celebrating the first 24-hours of a world without war!” This day is predicted as Wesak Day May 2025. 'You may say I'm a dreamer, but I am not the only one.